The Urban Land Institute (ULI) has revealed the three finalists for its Urban Innovation Ideas Competition, which aims to champion best practice in the development of cities and the creation of communities, places and spaces by sharing ideas, opening dialogue and engaging with industry participants. The competition was officially launched at the ULI City Forum on 22 August which involved a panel discussion about some of the challenges facing Melbourne into the future. The 2018 competition received a record number of submissions from young professionals and students from Melbourne, interstate and abroad, who were tasked with developing solutions for revitalising the north-west corner of Melbourne’s CBD, bound by La Trobe, William, Bourke and Spencer streets. The Competition's role is to provide a platform for entrants to share ideas and concepts for the 'site', with many focusing on improving streets for people, and adopting place making initiatives to boost activity within the area. Peter Holland, Director at Urbis and Trustee at the ULI. The finalists proposed a broad range of ideas to improve the area including upgrades to laneways, the creation of a civic plaza and the blocking of vehicular traffic on Spencer Street between Collins and La Trobe streets. The Competition has shown the fantastic ideas that young professionals and students have been able to generate with many high-quality submissions received this year. While this area of Melbourne is currently underutilised and lacking activity, the finalists have shown how it can be enhanced by tying it in with the city’s love of the arts. The jurors were delighted that so many individuals and groups responded in interesting ways to the challenge of making this part of our city more liveable and viable. Design, engagement and activation were integrated functions at some level in the majority of submissions showing the broad thinking of these young professionals. ‘Reflective Lane’ – Bohan Jones, Hee-Jung Yoon, Linda Lin and William Cai from Mirvac’s design team. ‘Welcome to Melbourne’ – Fabian Culican, Kavita Sonar, Shelley Black and Simon Zhao from Tract Consultants. 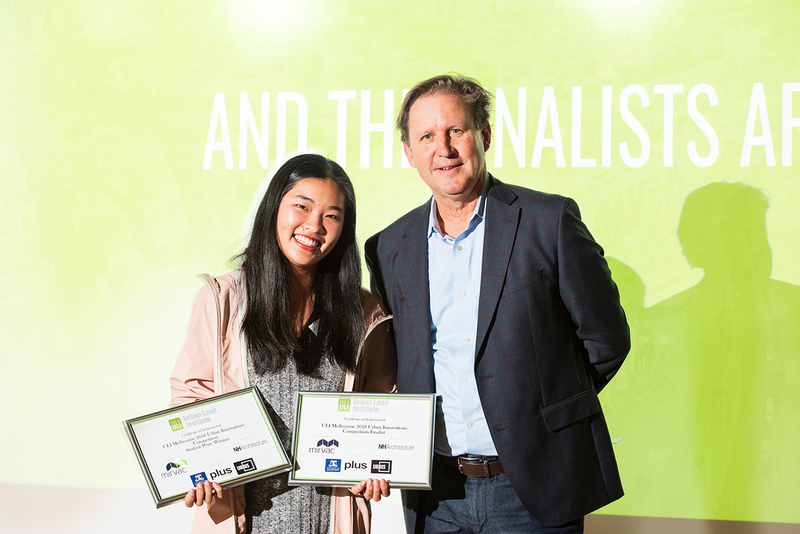 ‘Mixed Collectivo’ – Lindy Huang, a student at University of Melbourne; and Marc Schmailz, a student at Technical University of Munich. Mixed Collectivo are also recipients of the $500 student prize in addition to earning a place as a competition finalist. The three finalist teams will receive $2,000 and now proceed to the next stage of the competition to further refine and develop their respective concepts. The winner will be announced in late October and receive an additional $2,000 in prize money plus a trip to Shanghai to present their proposal at the ULI 2019 Asia Pacific Conference. The public is now invited to vote for their favourite submission from all entrants in the form of a ‘popular vote’ open until 22 October. at www.urbaninnovations.com.au.